Colony is coming back. According to Variety, USA Network has renewed their new sci-fi series for a second season. The series, which stars Josh Holloway and Sarah Wayne Callies, debuted on January 14th. 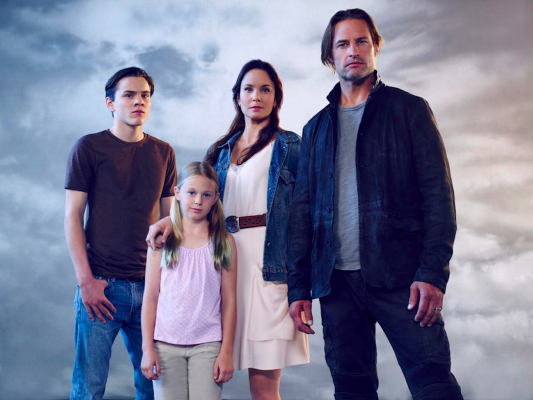 Created by Carlton Cuse and Ryan Condal, Colony stars Holloway as Will Bowman, a former FBI agent who lives in a near-future Los Angeles with his wife (Callies) and two children. The family is soon torn apart during an invasion from an extraterrestrial force. So far, the series has maintained low-but-steady ratings, averaging 1.27 million viewers per episode. Colony airs on Thursdays at 10 p.m. on USA Network. What do you think? Do you watch Colony? Are you glad it’s been renewed? More about: Colony, Colony: canceled or renewed?, USA Network TV shows: canceled or renewed? Colony, the only way they increased the viewer was to use the old tv tactic of pitting Blacks against Whites in the series. This tactic has been becoming more and more popular recently when shows are on their way out. This is one of the best new shows around, it has everything that that one wants in a series!! Amazing show. Intense and I will be using scenarios from this show for my intro sociology course I teach! LOVE IT! Great show. I tell everyone I know about it. I love the tension ; cheering for the rebels. Long live the human race!!!! Love the show. I never watch it when it’s actually on. I DVR it and watch two or three episodes at once. I hope that the ratings trackers are able to track people like me that don’t watch it when it first airs. Great new show! My wife and I enjoy watching it. We are very glad that it has been renewed for a 2nd season! It took me one airing to totally get involved with this drama. I love it! Of course I adore the lead actors, from TWD and LOST, but this premise is so intriguing. We have not seen the aliens but we know they are hovering close by. This is infectious! I hope the ratings rise soon. I want to see lots more!! And I am a 66 year old lady! I love TWD, Into the Badlands, and now COLONY! Excellent new series. I can’t believe prime time tv let this how go. Their loss. One of my favorite shows on television right now. And one of three I DVR. Great show. Waaaay better than falling skies and it went for 5 season I think. I’ve seen way worse shows go for way longer. I don’t have cable but I watch this show religously. I’m sure there are many more out there like me they need to poll the ratings instead of finding out how many people watch them. Tell people to go and rate the episode aND show at the end of every episode. Then you would get real ratings based on real viewers. My husband and I are watching and enjoy the show. Great show! Very well acted and produced. This show has potential to be one of the great ones! Very interesting and well acted show. I’m glad it is renewed. I love Josh Holliway!